On the first day of Christmas my true love gave to me a Humpy Dry Fly in a tall spruce tree. 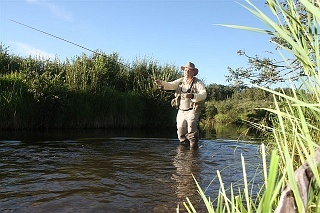 And as experienced fly-rodders know, when you deposit a wayward back cast into the upper branches of a stream-bank spruce while hiking one of Alberta's iconic foothills and boreal trout and grayling streams, there is no forgiveness. You can say "sorry" and promise not to do it again until your face turns purple, it almost inevitably ends in a break-off. But no worries, the holiday season with all its gift-giving and good cheer, is a perfect time to replenish your fly boxes and update your outfit by dropping a few unsubtle hints. Either that or you will be destined to wearing another Christmas sweater. On the second day of Christmas there's no better gift to receive than a pair of polarized angling glasses. They come in a variety of choices from dirt cheap to high-end technological wonders. But they all have one thing in common, their cosmic ability to strip away the sun's glare on water and allow your vision to penetrate the surface into the watery world of the fish. Day Three's gift selection is a collapsible ice-angling tent. 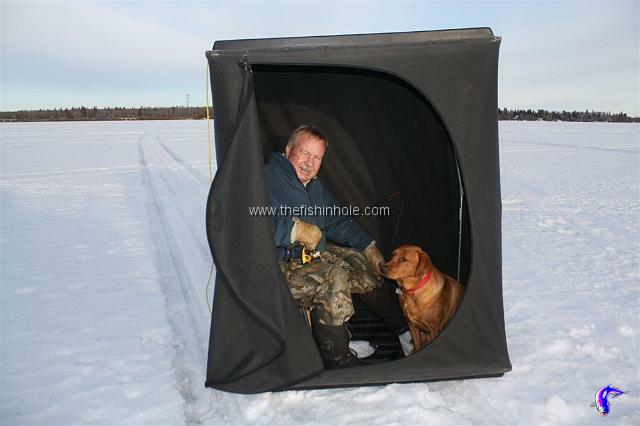 Long gone are the days when hard water anglers had to lie on the ice surface with a tarp over their heads to see into the mysterious environment below a frozen lake. 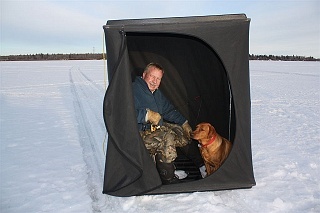 Or haul out an ice shanty that pretty well committed the angler to a single winter location. 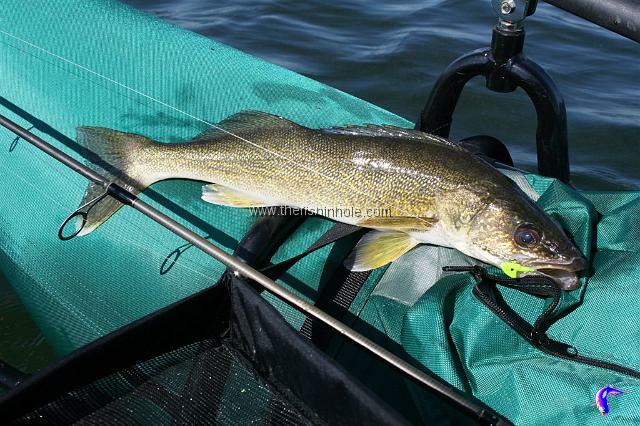 Ice tents not only protect anglers from the cold climate, their blackout walls allow the ice fisherman to look into the green, murky world where the walleye, pike, perch and trout live. On Day Four, nothing beats a new fishing hat. Whether it's broad-brimmed or baseball-style, dedicated anglers can never have enough hats. A hat shields your eyes from the sun while trying to drop a delicate cast beneath an overhanging willow. It protects your head and face from harmful ultra-violet rays which are one of the more serious health risks of recreational angling. But maybe most of all, it makes a statement - fishing is what we do. So get over it. On Day Five, if my true love really wanted to impress me, she would give me a new pontoon boat. Pontoons are the ultimate in personal water craft (although there are some useful two-and-three person models too). They are a step up from a float tube but not quite as cumbersome as a traditional aluminum car topper. Either propelled by oars and flippers or mounted with an electric motor they give anglers great mobility on small and medium-sized still waters and are excellent for running rivers too. With the bladders deflated and frames disassembled they require very little space when transported. On Day Six my true love went high tech. Anglers and gadgets naturally go together and today there are an array of GPSs,fish finders and underwater cameras to keep the technologically-minded fisher in the family happy. Any big lake appears to the untrained eye as a ubiquitous mass of flat water. But beneath the sublime surface is a complex terrain of ridges, drop offs, rock piles and weed beds. All with the ability to attract and hold game fish. Locate them with a fish finder, mark and record them with a GPS and you will be catching on days when the rest of the guys on the lake are just fishing. Underwater cameras have also added a new dimension to ice angling. Especially when fishing in deeper or tainted water where visibility is restricted. Even if the fish for reasons only known to them are avoiding your lures, you can still watch their underwater antics on Perch TV. Day Seven is all about safety on the water. Whether in a boat,float tube or wading the greasy rocks of a big, hard-charging river, keeping alive while doing what we love to goes without saying is pretty important. Most standard boating personal floatation devices are bulky and cumbersome and unfortunately usually end up being used as seat cushions. Inflatable, collar-type PFD's are a clear solution to the flexibility problem. They are a tug of the rip chord away from protection in case of an on-water mishap but at the same time their slim profile doesn't compromise casting, netting, rowing or simply scratching your head in frustration because the fish aren't biting on what you're offering. A new rod and reel combo is the perfect way to celebrate the Eighth Day of Christmas. Because, when it comes to angling, you can't have one without the other and an unmatched rod and reel selection can quickly become cantankerous and aggravating. For a rookie angler, a 5-weight fly rod with matching reel and line or medium actionspin caster and rod package under the tree, can become the gift for a lifetime of fun. But make sure it is a "real" rod and reel combo of which there are good selections available at affordable prices. Because nothing can turn off somebody new on the water - whether they are six or sixty - than a rod that won't cast easily or a reel that disintegrates in their hands. Mastering the art of the fly rod backcast or coordinating the lift of your thumb with the flip of a spin caster is difficult enough without having to fight faulty equipment. Even seasoned veterans with a tackle-room full of rods will always appreciate one more specialty rod for a specific angling scenario. Just ask. I guarantee you will get an answer. Whether on a northern mid-summer lake or a winter-getaway bonefishing adventure, the sun is always going to be a serious factor. That's why Day Nine is all about UV protection. A lifetime of bombarding your skin with the sun's ultra violate rays is not only dangerous, it can be life threatening. In the tropics where the sun's intensity can fry pale northern winter skin in an afternoon on the flats, it becomes a vacation wrecker. The way to guard against this is with a new fishing shirt for Christmas with a high UV protection rating. Boost your defenses and stylize your outfit with a Buff. They come in a riot of colours and prints and can be worn as a neckerchief, headband, wristband, mask, hairband, balaclava, scarf, scrunchie, beanie, bandana, or if you really want to go crazy, a pirate cap. Perfect for hiding behind when running in a boat where your face takes a beating or making a fashion statement when you're in camp. There's nothing as inevitable as death, taxes and leaky waders. Not much you can do about the first two. But Day Ten is all about a new pair of breathable waders with matching wading boots. No more soggy socks after a day on a trout stream. The chilly trickle of Rocky Mountain ice water down your leg can be avoided. At least for a year or two.Simms, Bare and Redington all make a quality wader that will stay reasonably watertight for years. But it's also worth having a tube of wader repair adhesive on hand. Just in case.